Test candidates Will Pucovski, Matt Renshaw, Joe Burns and Marnus Labuschagne failed yesterday before Kurtis Patterson hammered 157* against Sri Lanka to underline why he was unlucky not to make the Australian Test squad. Patterson and Jake Doran (102*) rescued the Cricket Australia XI from 3-25 after Renshaw, Burns and Labuschagne each was dismissed for single figures by the Sri Lankan quicks. Pucovski looked classy during his knock of 23 before top edging a hook shot to deep fine leg. Renshaw, Burns, Labuschagne and Pucovski all were named in Australia’s 13-man squad for the two-Test series against Sri Lanka which starts in Brisbane next Thursday. Those four batsmen are competing for just three spots in Australia’s top six, with Usman Khawaja, Travis Head and Marcus Harris considered locks for the first Test. Burns is reportedly the front runner to open with Harris in the series opener, with the selectors considering playing Renshaw in the middle order, according to Fairfax Media. That would be a major change for Renshaw, a career opener whose only experience outside of that position is a few innings batting at three for Somerset in English county cricket last year. Regardless Renshaw opened yesterday with Burns, the man he partners at the top of the order for Queensland in the Sheffield Shield. The CA XI were in a mess at 5-98 when Patterson and Doran took control of the match. Patterson by that stage had cruised to 48 from 73 balls looking completely untroubled by a Sri Lankan pace attack which had done so much damage. Doran played within himself for his first half an hour at the crease, creeping to 4 from 20 balls, before he began to unfurl his full range of strokes. The 22-year-old Tasmanian wicketkeeper-batsman was particularly aggressive against Sri Lanka’s spinners, sweeping powerfully again and again. Opposed to the visiting quicks Doran looked to punish them off the back foot, especially through gully and point. With a rock solid defence as his foundation, he began to flay the Sri Lankan bowlers, reaching his ton just before the 75-over limit imposed on each innings in this three-day tour match. It was a welcome return to form for Doran who averaged just 15 in the first half of this Sheffield Shield season after having a breakout Shield campaign last summer when he piled up 756 runs at 44. But the most significant knock of the day was by Patterson, who must have been bemused when the likes of Labuschagne and Pucovski were preferred to him in the Test squad. 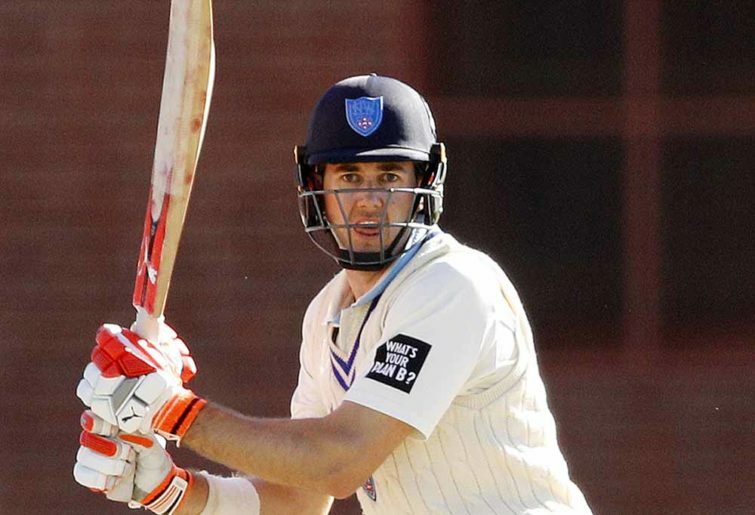 Patterson has been ultra-consistent for NSW in the Shield, averaging 48, 37, 45 and 53 over the past four Shield seasons. Further underscoring his reliability is the fact that, across 61 innings in that period, he has 21 scores of 50-plus. Patterson has also been highly impressive when asked to take a step up to play red ball cricket for Australia A and the Cricket Australia XI, making 500 runs at 62 across six matches. The tall left-hander has a capacity for making tough runs, as he underlined with his Man of the Match performance in the Shield six weeks ago. In a very low-scoring match on a lightning Perth Stadium pitch against a strong WA attack, Patterson made 107 and 43 batting at first drop. At 25 years of age, with almost 4,000 first-class runs to his name, he has an appealing mix of youth and experience. Yet, for some reason, the selectors have ignored him. Perhaps yesterday’s imperious ton will finally land Patterson on their radar.